Rhythmic, soothing and danceable – it’s no wonder reggae music remains wildly popular decades after the death of icon Bob Marley. This revered musical style will echo through Downtown Lakewood next Friday, July 7, when Carlos Jones opens LakewoodAlive’s 2017 Front Porch Concert Series. Sponsored by Bentley Wealth Management of Raymond James, the Front Porch Concert Series features free, live music on the front porch of Lakewood Public Library (15425 Detroit Avenue) in Downtown Lakewood from 7 to 9 p.m. for 11 consecutive Fridays. The series, which aims to foster and sustain Lakewood’s vibrancy while providing a family-friendly summer entertainment option, runs through September 15. Week 1 of the series brings to the stage local reggae star Carlos Jones. 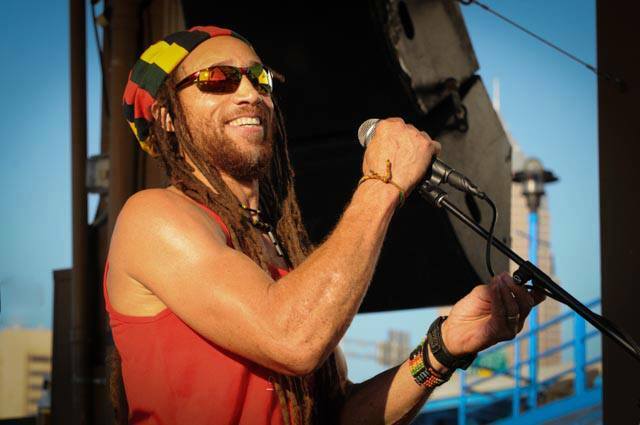 A key figure within the Cleveland reggae scene for nearly 40 years, he has toured extensively throughout the region for decades, gaining a large and loyal following of reggae enthusiasts. Carlos Jones specializes in traditional roots reggae, which was first popularized by Bob Marley. This pleasing style features rhythmic melodies and harmonies with emphasis on acoustic and percussion.